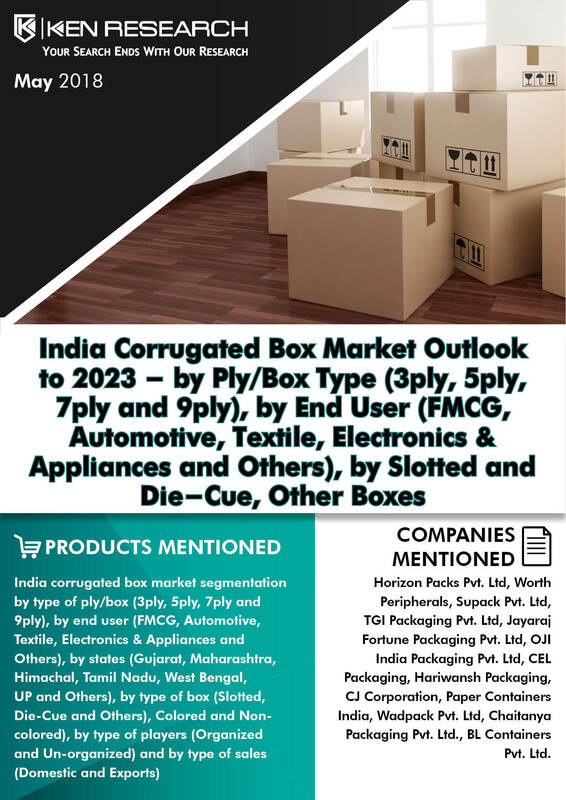 The report titled “India Corrugated Box Market Outlook to 2023 – by Ply/Box Type (3ply, 5ply, 7ply and 9ply), by End User (FMCG, Automotive, Textile, Electronics & Appliances and Others), by Slotted, Die-Cue Box and Others” provides a comprehensive analysis on India corrugated box Market. The report covers various aspects including introduction and genesis, market size by revenue, market segmentation by type of ply/box (3ply, 5ply, 7ply and 9ply), by end user (FMCG, Automotive, Textile, Electronics & Appliances and Others), by states (Gujarat, Maharashtra, Himachal, Tamil Nadu, West Bengal, UP and Others), by type of box (Slotted, Die-Cue and Others), by type of Box (Colored and Non-colored), by Organized and Unorganized market and by Domestic and Exports Sales. Major players in India corrugated box market (Worth Peripherals, TGI Packaging Ltd., OJI India Packaging Pvt. Ltd., Horizon Packs Ltd., Jayaraj Fortune Packaging Pvt. Ltd., Supack Industries Pvt. Ltd., Chaitanya Packaging Pvt. Ltd., CEL Packaging, Hariwansh Packaging Pvt. Ltd., CJ Corporation, Paper Containers India Pvt. Ltd., Wadpack Pvt. Ltd. and BL Containers Pvt. Ltd.). The report also covers Value Chain Analysis, Investment model to set up a corrugated box plant in India, Government regulations, buying decision parameters from end user point of view, Snapshot on India Kraft paper market, Export and Import trade scenario, along with analyst recommendation and macroeconomic variables. This report will help the reader to identify the ongoing trends in the industry and anticipated growth in future depending upon changing industry dynamics in coming years. The report is useful for E-commerce companies, investors, potential entrants and other stakeholders to align their market centric strategies according to ongoing and expected trends in the future. Market Size: India corrugated box industry is an inevitable part of manufacturing sector which rely heavily on corrugated packaging for finished goods transportation and handling. India corrugated box industry grew from at a CAGR of 23.3% in terms of revenue. Factors such as increasing demand from fresh food and beverages, home & personal care goods, electronic goods industries, logistics application, increasing consumer awareness towards sustainable packaging and growth of the e-commerce industry have propelled the growth of Indian corrugated boxes market. 5 ply type of box has contributed a significant share in terms of sales volume in FY’2018. 5 Ply type of box has dominated the market as these boxes are now manufactured through fully automatic machines which increases the strength of the box and is used in place of 7 ply and 9 ply type of boxes. In FY’2018, FMCG segment has dominated India corrugated box market. The automotive, textile and electronics & appliances industry contributed robust share has followed FMCG sector. Other end user such as paints, pesticides, distillery products, E-Commerce, Home Merchandise & Garments has least revenue contribution in corrugated box revenue in FY’2018. In FY’2018, Gujarat has dominated India corrugated box market. Gujarat dominated on back of the growth in FMCG and pharmaceuticals sectors in different regions of Gujarat therefore increasing the demand of corrugated boxes. Maharashtra, Himachal, Tamil Nadu, West Bengal and UP has followed Gujarat during FY’2018. Non-colored corrugated boxes dominated as they are preferred by those end users who have to pack and store the products in the warehouse or godown. Colored boxes are generally manufactured on end user demand and are used for packaging children related products such as toys, games, soft toys and others, food items such as frooti, noodles, biscuits and others. In FY’2018, regular slotted type of box has dominated the market. Regular slotted boxes are most preferred as they are easy to manufacture and moreover, the production is also fast. Other type of boxes include full telescope box, partial telescope box, corrugated tray often used for display purposes, corrugated corner pads used for product support and cushioning contribute a minimal share in terms of sales volume in FY’2018. India corrugated box market is highly fragmented with the presence of around 18,000 organized and un-organized players. There are no regulations in the market regarding the entry of the players and since it is a low capital intensive business so many new players are entering in the market. Horizon Packs Pvt. Ltd. is the leading manufacturer. Other leading companies are Worth Peripherals Ltd., TGI Packaging Pvt. Ltd., OJI India Packaging Pvt. Ltd., Jayaraj Fortune Packaging Pvt. Ltd., Supack Industries Pvt. Ltd., BL Containers Pvt. Ltd., Chaitanya Packaging Pvt. Ltd., CEL Packaging, Wadpack Pvt. Ltd., Hariwansh Packaging Pvt. Ltd., CJ Corporation and Paper Containers India Pvt. Ltd.
India corrugated box industry is expected to increase at a CAGR of double digit CAGR in between the FY’2018 and FY’2023 in terms of revenue due to the elevating demand from the end user segment in order to store and transport their end products. Increasing the demand of safe and cushioned packaging of the product will augment the growth of India Corrugated box market. The procurement of latest technology machines from China, Taiwan and other Asian countries by manufacturers in order to make production fast and accurate will also drive the future of India corrugated box industry. The paper board packaging market will record revenue of USD 66 Billion by 2020 due to more players entering the market, expansion of e-commerce sector in the country, increasing demand of personal care & health care products. The paper packaging industry is largely comprised of unorganized players. There are a few large players such as TCPL, ITC, Parksons Packaging, and others. The future prospects of India Recycling PET Industry are impressive on the groundwork of an increase in disposable income fueled by growth in youth population that marked an increase in the availability of post consumer recycled PET waste bottles.